Since the inception of industrial injection molding, keeping an even temperature on the surface of the mold has been a constant challenge. In their quest to maintain even temperatures, manufacturers have used baffles, bubblers and heat pipes; they’ve laminated blocks together and added complex drilling set ups to their molds. Over the last decade or so, conformal cooling — designing cooling channels that naturally follow the contours of the part to be produced — has been positioned as a solution for controlling injection-molding temperatures. But conformal cooling adds new layers of design and production complexity to the mold-making process, placing it beyond the means of most shops. Bastech, an Ohio-based one-source solution provider for shop floor, additive manufacturing services and equipment sales, has wrestled with temperature issues, but believes it has found a way to introduce a new level of simplicity, efficiency and economy to conformal cooling. The company’s research is aided by its status as a 3D Systems Authorized Gold Partner, giving it access to the latest 3D printing technologies and intelligence. Bastech’s breakthrough, documented in two recent benchmark tests, is based on 3D Systems’ Cimatron™ mold-making software and its ProX® 200 direct metal printing (DMP) system. Simulations for the conformal cooling mold designs are performed using Moldex3D software, a partner with 3D Systems, and the completed DMP molds are inspected using 3D Systems Geomagic® Control software. The process represents an end-to-end manufacturing solution with easy integration between the digital and physical worlds, all powered by 3D Systems products. “The combination of powerful software designed to leverage the full capabilities of 3D printing, with printers that deliver a fully dense metal part with smooth surfaces and limited post processing provides a rock-solid methodology for building customized cooling molds,” says Ben Staub, Bastech CEO. Bastech’s first benchmark compared two very similar parts in terms of volume, size and design configuration. One was designed with a conformal core and then 3D printed; the other was designed with a standard spiral baffle configuration and manufactured by conventional means. The conformal cooling design was created with Cimatron, expert CAD/CAM software that covers the entire mold-making cycle — from quoting to design, applying engineering changes, NC and EDM programming. The latest version of Cimatron includes cooling design and analysis capabilities that support both traditionally drilled cooling channels and conformal cooling channels for manufacturing using 3D printing technologies. Through close integration with Moldex3D, injection mold designers working in Cimatron have the ability to perform automated mold-filling analysis to optimize cooling channel layout. Bastech’s design for the first benchmark was a tapered helix that is positioned on the inside of a spacing cone used for industrial assemblies. Conformal cooling channels were created by rotating a teardrop configuration so that one side was parallel to the outer surface of the core while maintaining a constant distance from it. By running the cross-section along a tapered helix, Bastech was able to design geometry that the ProX 200 could build in a single run. The design for the 3D printed mold took two days and was built on the ProX 200 in three days. To maximize its productivity, Bastech combined the 3D print run for the mold with parts required for other Bastech projects. The ProX 200 is a cost-effective alternative to traditional manufacturing processes, offering reduced waste, greater speeds for production, short setup times, very dense metal parts, and the ability to produce complex assemblies as a single part. For the reverse-flow helix core, the design and analysis in Cimatron software, combined with 3D printing on the ProX 200, saved more than 40 hours of programming and shop time. When all costs were taken into consideration, the 3D printed core yielded a net savings of $1,765 (18%) over conventional methods, according to Young. More importantly, the conformal cooling mold maintained a lower temperature throughout the run and reduced cycle time by 22%. “Cycle time is nearly everything in injection molding, with the ability to consistently control temperature a close second,” says Staub. In a second benchmark, Bastech went beyond the conformal core to design a complete core, cavity and slide-mold set for 3D printing. In this case, the goal was to maintain the same temperature (110F) between the conventional and conformal designs to see how it would affect cooling and cycle time results. Once again, major time savings were recorded for programming, machining and polishing, and EDM was completely eliminated in the conformal cooling design. Automation within Cimatron software reduced design time from 30 hours to just seven for the conformal cooling mold. 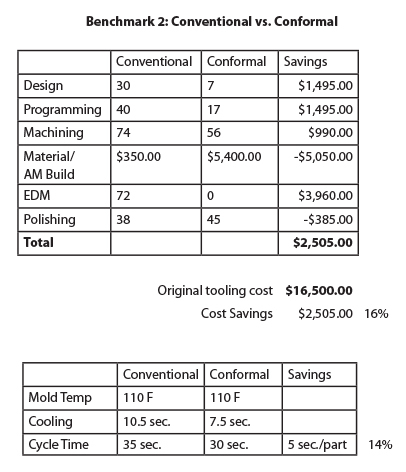 Total cost savings for the 3D printed mold was $2,505, a 16% savings. Cooling time was reduced from 10.5 seconds for the conventional mold to 7.5 seconds for the conformal mold, and the all-important cycle time was reduced by 14%. “Even though the temperature remained the same for both the conventional and the conformal cooling designs, the conformal design forced more liquid through a greater surface area, making it more efficient in cooling the mold,” says Young. Bastech purchased the ProX 200 DMP system through a grant from the state of Ohio and the University of Dayton’s Research Institute, so part of the company’s mission is to share results with the industrial community. Staub hopes that Bastech’s benchmark efforts will show shops of all sizes that there are solid, end-to-end solutions available to achieve conformal cooling.